All those interested in JCP MUST be approved by Director. 2019 SPRING JCP try outs are Saturday March 16 at 2pm. The amount of emphasis in each area will be based on level of play (novice, satellite, and open). Students will be assigned to the appropriate level as determined by the program director, and reassignment based on student's performance can be rendered at any time by the program director. Novice players have a working knowledge of groundstrokes, serves, and volleys. They are also able to keep score, while having little to no competitive experience. 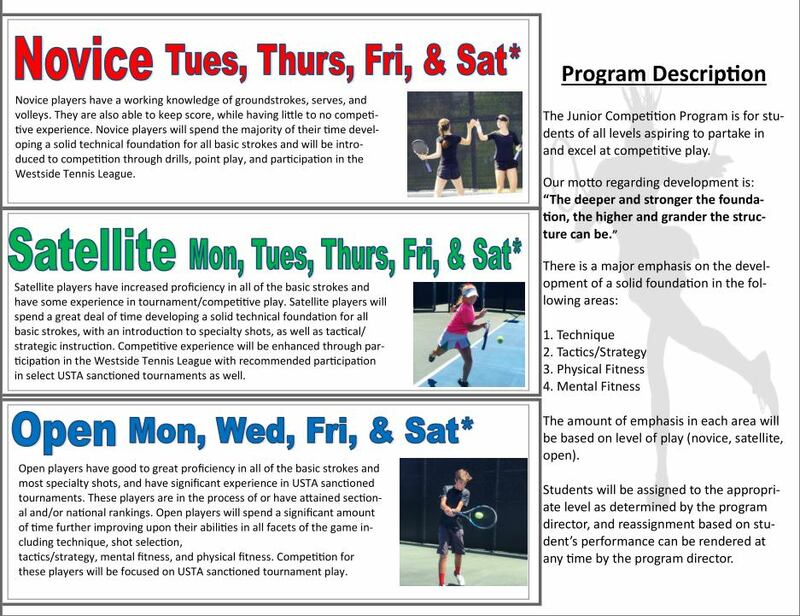 Novice players will spend the majority of their time developing a solid technical foundation for all basic strokes and will be introduced to competition through drills, point play, and participation in the Westside Tennis League. Satellite players have increased proficiency in all of the basic strokes and have some experience in tournament/competitive play. Satellite players will spend a great deal of time developing a solid technical foundation for all strategic instruction. 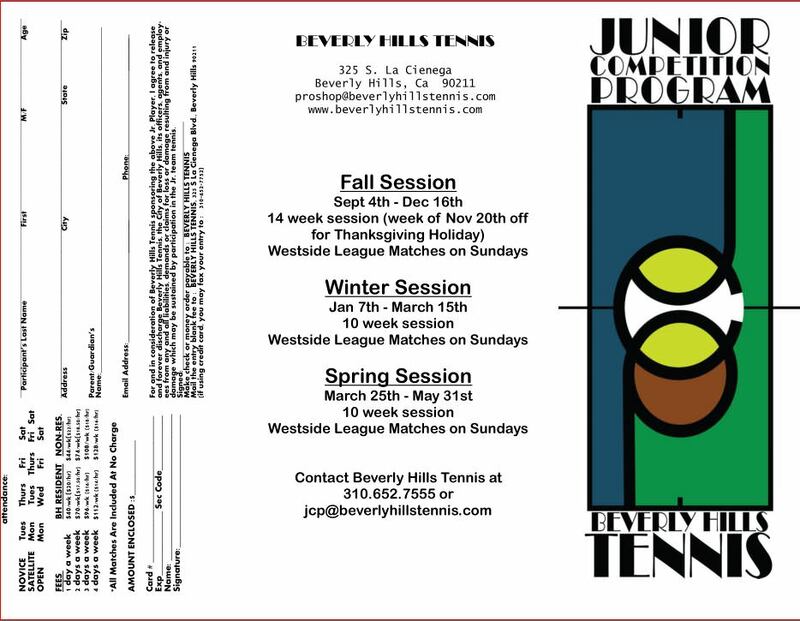 Competitive experience will be enhanced through participation in the Westside Tennis League with recommended participation in select USTA sanctioned tournaments as well. Open players have good to great proficiency in all of the basic strokes and most specialty shots, and have significant experience in USTA sanctioned tournaments. These players are in the process of or have attained sectional and/or national rankings. Open players will spend a significant amount of time further improving upon their abilities in all facets of the game including technique, shot selection, tactics/strategy, mental fitness, and physical fitness. Competition for these players will be focused on USTA sanctioned tournament play.